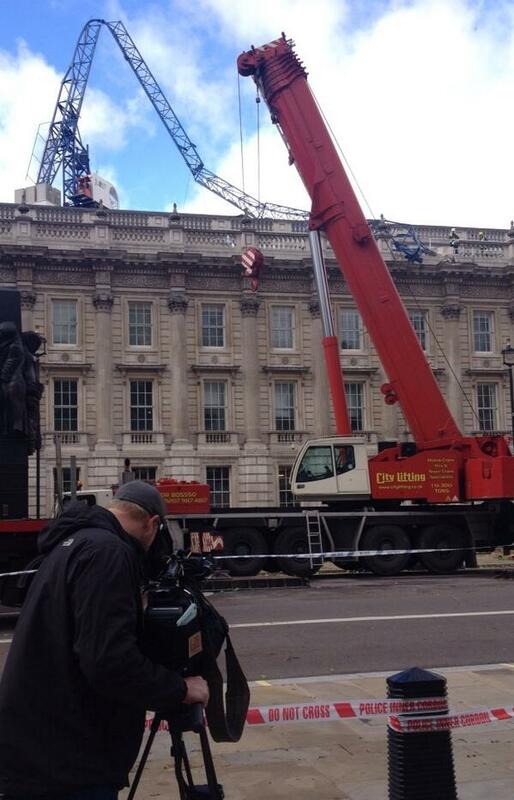 A crane near Downing Street has collapsed as winds of up to 99mph battered Southern Britain. 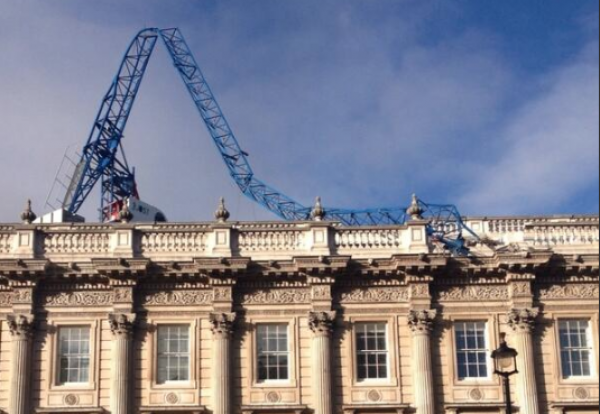 The jib of the Jost luffing crane buckled onto the roof of the Cabinet Office during the storm which caused chaos on construction sites. Eye witnesses at photo agency Political Pictures said the crane collapsed at 6.50 this morning. Debris from the damage balustrade of the Cabinet Office roof fell into Whitehall but no-one was injured. It is understood that the crane was due to be dismantled this weekend but the job was cancelled due to bad weather warnings. 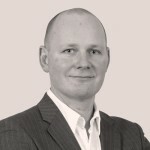 Deputy Prime Minister Nick Clegg has cancelled a scheduled press conference at the Cabinet Office this morning. A mobile crane has now been brought in to remove the stricken structure. Many major sites were also in lock down this morning across the region with tower cranes unable to operate in the high winds. 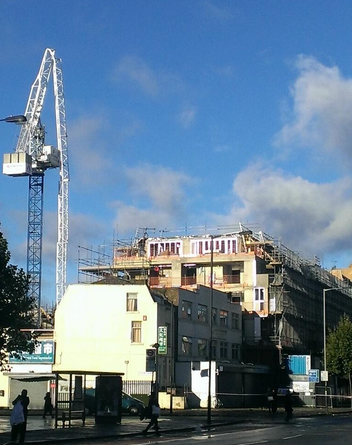 A crane jib also failed at a site in Old Kent road, south London. The London Fire Brigade said it was having to deal with a string of incidents across the capital. 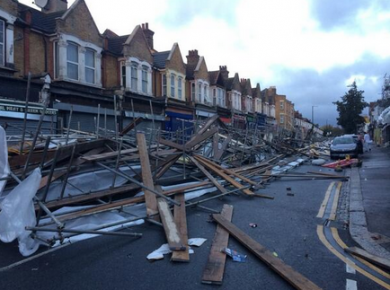 In Leyton, east London Francis Road was blocked when 100 metres of two-storey scaffolding blew down. 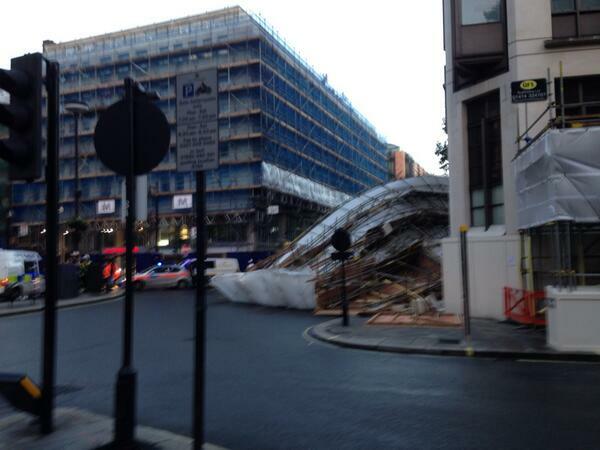 And in Mayfair’s Berkeley Square, west London a large scaffold structure came down this morning. More updates here as incidents are reported.